Day 011 | Does My Homeowners Insurance Cover Flooding? When you think about it, water is insanely important to our day-to-day lives. Our bodies need it…can’t live without it. Our food sources depend on water. We need water to survive. And yet, this liquid that covers 71% of the earth can be extremely destructive. Generally speaking, water that comes from the top down is covered by homeowners insurance. For example, if wind shatters a window or damages the roof allowing rain or snow to get into the home, this is covered. Water damage caused by burst pipes and ice dams on a roof is also generally covered by your insurance. However, water that comes from the bottom up, such as an overflowing stream, is not covered by your homeowners policy. You would need a separate flood insurance policy. A flood doesn’t have to be water over your roof or what we see on the news. I don’t live in a flood zone, so why do I need flood insurance? Everyone can use flood insurance. Flooding can happen in all 50 states. 25% of flood losses come from low-risk areas. Homeowners policies only cover damages caused by falling water, not damages caused by rising water. Flood insurance is the only way to protect yourself in the event of a flood. Flood insurance requires a 30-day wait period on voluntary purchases. If you wait until the last-minute to purchase it, it may be too late. Just because you paid off your home doesn’t eliminate the risk of a flood. Even a few inches of water can cause thousands of dollars in damage. To receive federal assistance, the area must be declared a federal disaster area by the president of the United States. If that happens, federal assistance comes in the form of a loan that you have to qualify for and pay back with interest. If your home is not in a designated high-risk zone, you can purchase a Preferred Risk Policy. Which can be budget friendly. 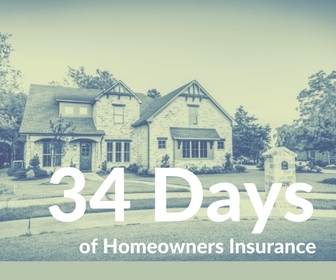 34 Days of Homeowners Insurance – They’re all here.